Full protection for television WP 230 TV2, Schuco + F connector Full protection for TVs and other TV receivers with Schuco contact and antenna F connector input. The module prevents from the unwanted effects due to power surges, spikes in supply voltage, electrostatic and others. Surge protected adapter Primera-Line, Brennenstuhl, 13.500A, 1506950 Surge protector Primera-Line 13.500A protects efficiently from surges, caused by indirect lightning strikes or inductive loads activation, the appliances like TV, HiFi, Video, PC connected after the adapter. Peak WPM-FTV fuse for TV and VCR Surge protector with increased reliability for cable or TV antenna,VCR. Security Cameras Protection KP "Zeжs" XBNC Protection Security Cameras SONO KP "Zeus7" XBNC, protection from high voltage lightning and power surges, for security video systems (cameras, recorders) with BNC connector and grounding. Security Cameras Protection SONO KP "Zevs7" XGBNC Protection Security Cameras ZEVS7-X with filter for galvanic isolation, BNC connector and grounding. Plug-In Surge Protector WP 230W, for home appliances, SONO Combined voltage/surge protector for any electrical home appliances SONO (WP 230W) designed for high / low voltage protection and mains power supply malfunctions. Direct plug-in design. Sound and lighting indiaction. Microcomputer control. Automatic recovery. EMI/RFI filter. 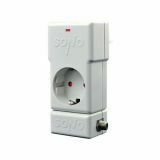 Plug-In Surge Protector WP230BF, SONO WP230BF/16A is a surge protector with 1x grounded outlet for wall mount designed for peak voltage protection for TVs, computers, laptops, printers, and etc. Not suitable for heating appliances and cooking stoves. It protects devices against dangerous over/ under voltage, main power supply malfuncions, electric shocks. List Price 16.50лв. VAT Incl. 15.67лв. VAT Incl.